Footpaths and tracks are immediately accessible from the gardens and provide excellent walking access to the surrounding countryside. 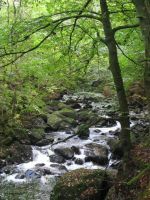 A wealth of information is available on the Snowdonia National Park website and this is a good place to start gathering information on both leisure walks and mountain walks. A number of leisure walks are close by, such as the Torrent Walk, Glyn Aran Walk and Precipice Walk. These are all near the town of Dolgellau, which is about 14 miles away. More challenging mountain walks are also within easy reach, including the Minffordd Path which is the shortest ascent of Cadair Idris.